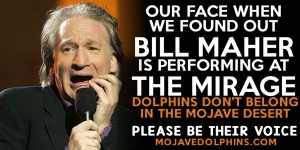 It has been brought to our attention that comedian Bill Maher is set to perform at the Mirage in just a few days. 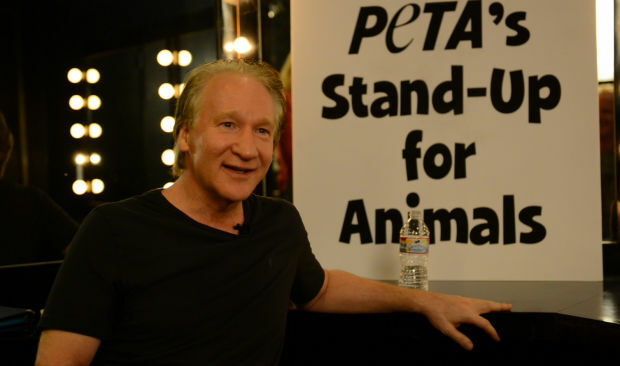 This is a big deal because Bill Maher is an animal rights activist, and a celebrity PETA supporter. PETA actively condemns The Mirage and their use of dolphins as aquatic circus entertainers in the middle of the Mojave Desert. How did the controversey surrounding this venue and their use of animals for profit manage to slip through the cracks at the hands of Bill Mahers management team? 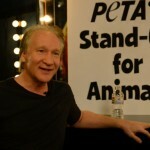 Bill Maher has said that he is a “big animal rights guy”, and has been an outspoken animal rights activist for decades. He has worked with groups such as PETA, Best Friends Animal Society, and Farm Animal Rights Movement. 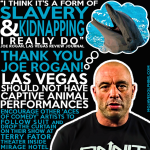 His show “Real Time with Bill Maher” has seen guests such as John Hargrove and Paul Watson, two outspoken cetacean rights advocates. Bill Maher once told McLean’s manazine that he finds “any form of animal destruction” to be the saddest thing in the world. 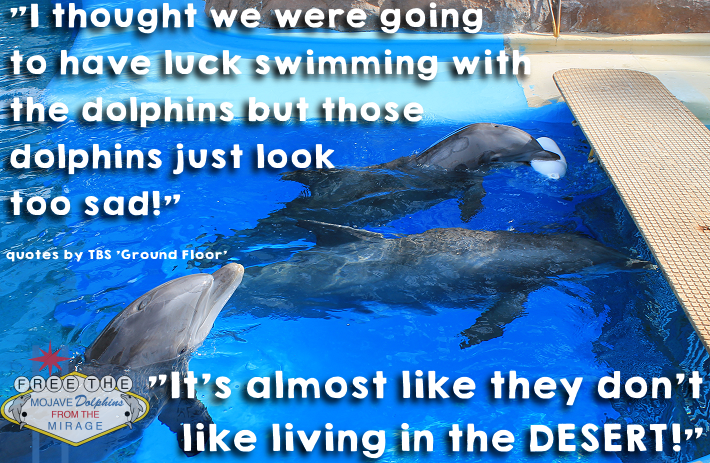 The 9 remaining dolphins at the Mirage Hotel and Casino in Las Vegas are just weeks away from scorching summer temperatures here in the Mojave Desert where their captors, MGM Resorts International, refuse to build them a shade structure. Animal Welfare Act regulations state under 9CFR Section 3.103(b) Facilities, Outdoor, Shelter: Natural or artificial shelter which is appropriate for the species concerned, when local climatic conditions are taken into consideration, shall be provided for all marine mammals kept outdoors to afford them protection from the weather or from direct sunlight. 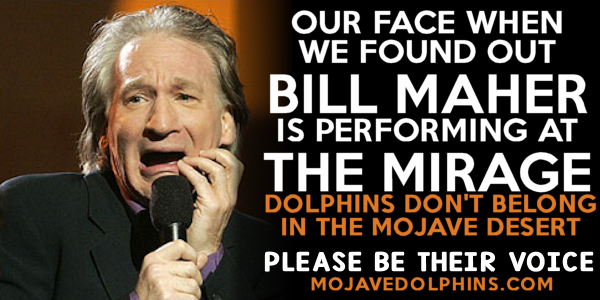 We urge Bill Maher to please be the celebrity voice that these dolphins desperately deserve. 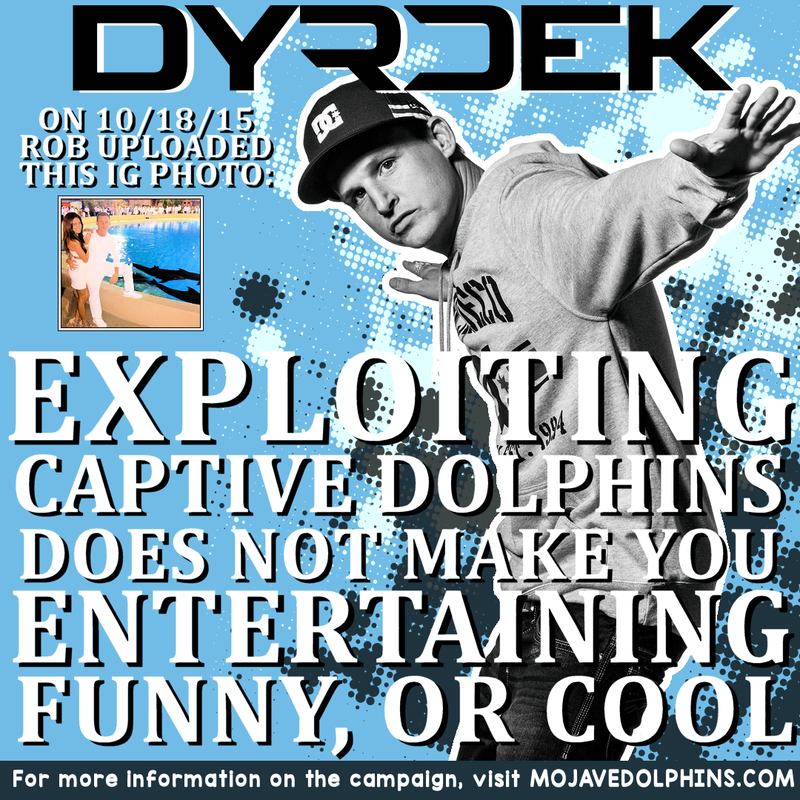 25 years is far too long for Atlantic bottlenose dolphins to be held prisoner in the middle of the Mojave desert. What happens in Las Vegas in the backyard at the Mirage Casino needs to be shown to the world. The Mirage Hotel is amping up their celebrity endorsements this year. 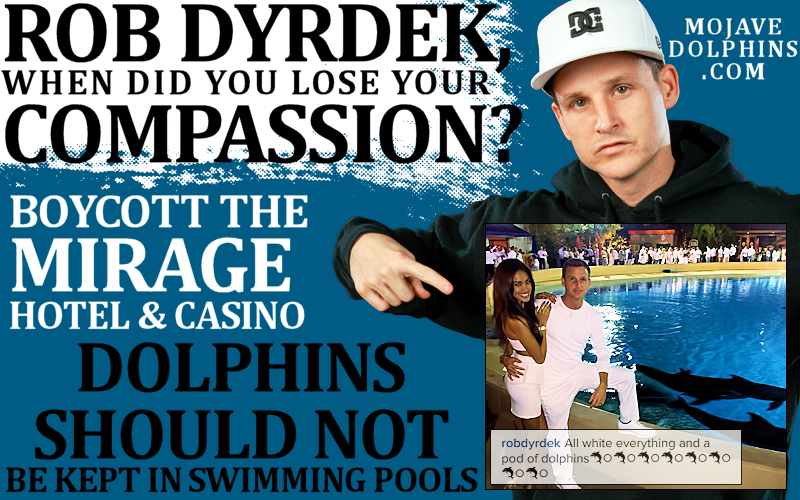 We have seen several posts by people of significance promoting the casino and their exploitative dolphin program. A few of the celebrities make money off of the Las Vegas strip, so it is important that we continue to reach them in a polite, factual matter. 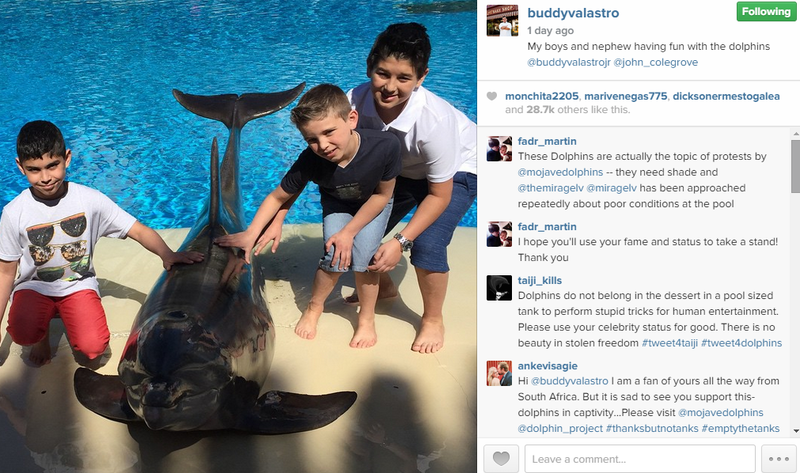 We must show these celebrities compassion in our messages if we want them to show the same for the dolphins. People will not take our campaign seriously if we are hurling insults back and forth. We need the campaign to succeed for the sake of the dolphins. Britney Spears visited the habitat on the same day as our research team, and the same day as our protest on the strip to raise awareness for Maverick. This is the second time that Britney Spears has visited the dolphin habitat at the Mirage Hotel. Britney has visited the hotel in 2010 and 2015. Britney Spears is currently a resident performer at the Planet Hollywood Hotel and Casino, just a couple properties away from the dolphins. It is understandable that she is looking for family friendly entertainment to take her children to while they are in town, but she should be teaching her children to have compassion and respect for animals. You can’t do that while exploiting them in photo ops and swimming while latched onto their dorsal fin. Buddy Valastro is the face behind TLC’s hit show, Cake Boss. Buddy has both a bakery (Carlo’s Bakery) and restaurant (Buddy V’s) at the Venetian on the strip in Las Vegas. 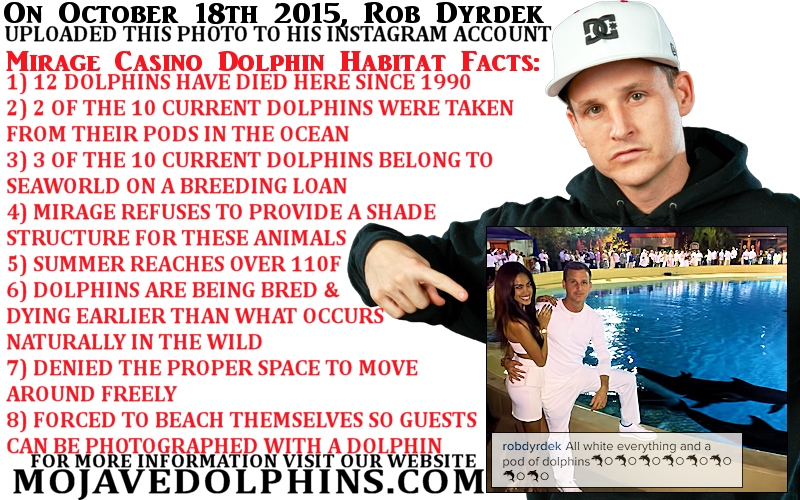 He had the young children in his family visit the dolphin habitat on April 8th 2015. 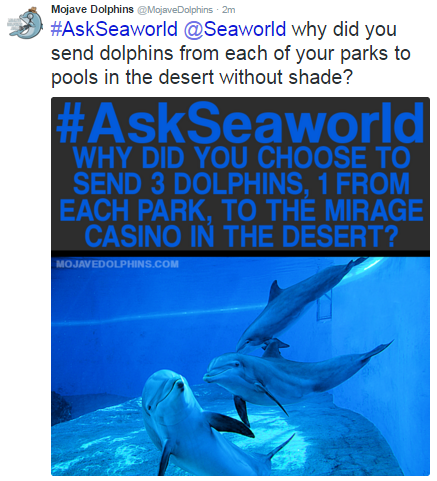 These young minds are highly impressionable, and deserve to know the truth about dolphins and how places like the Mirage continue to exploit them for monetary gain, without providing them the simplest of shade structures. Most children would feel heartbroken for the dolphins conditions if they were enlightened to the truth behind the dolphin smile. 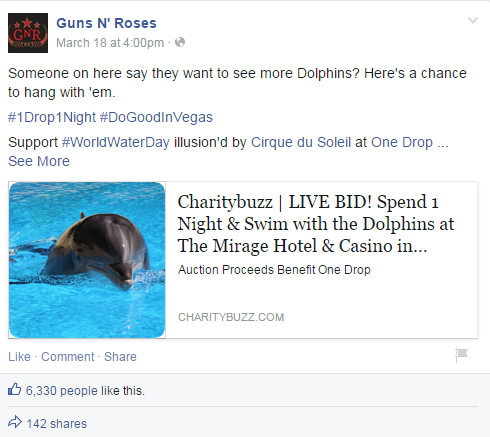 Guns N Roses promoted the Mirage Hotel and their dolphin exploition program on March 18th 2015. Former member Slash has been a musical guest with Kings of Chaos at a benefit for Ric O’Barry’s Dolphin Project. Former member Matt Sorum is on the Dolphin Project Board of Directors. Matt even has a music video dedicated to dolphins and the ocean. The video for the song “Estranged” by Guns N Roses relied heavily on cetacean imagery, and lead singer Axl Rose was quoted as saying “The dolphins assimilate a state of peace or grace.” A band like this who has been around for several decades has legions of fans, spanning around the entire globe. If Guns N Roses were to get on board with our campaign, the dolphins would get instant worldwide exposure, and the Mirage would be faced from extreme amounts of pressure. 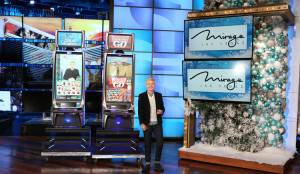 A few months ago, we blogged about Ellen DeGeneres giving away a trip to the Mirage during her Christmas special. On March 20th 2015, Ellen uploaded a promotion to her website for the Mirage Hotel. She describes the property, but leaves out the fact that animals are being used and abused for your entertainment. 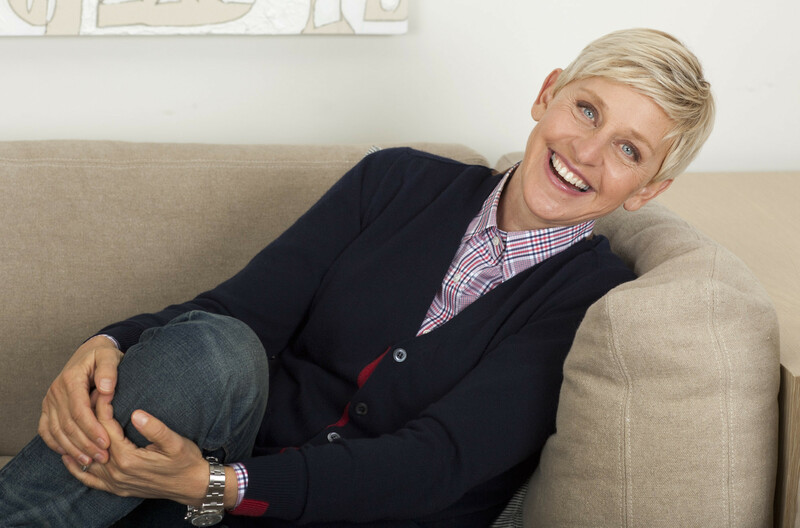 Back in 2010, Ellen was outspoken about asking her viewers to watch the heart-wrenching documentary “The Cove” about how dolphins are captured and slaughtered in Taiji, Japan, and how the entire round-up is fueled by the global cetacean captivity industry. The only excuse we can think of for her change of heart is the fact that Mirage (and several other MGM properties) have placed her new slot machines on their casino floor. Greed is the only thing keeping these dolphins from the life they deserve. 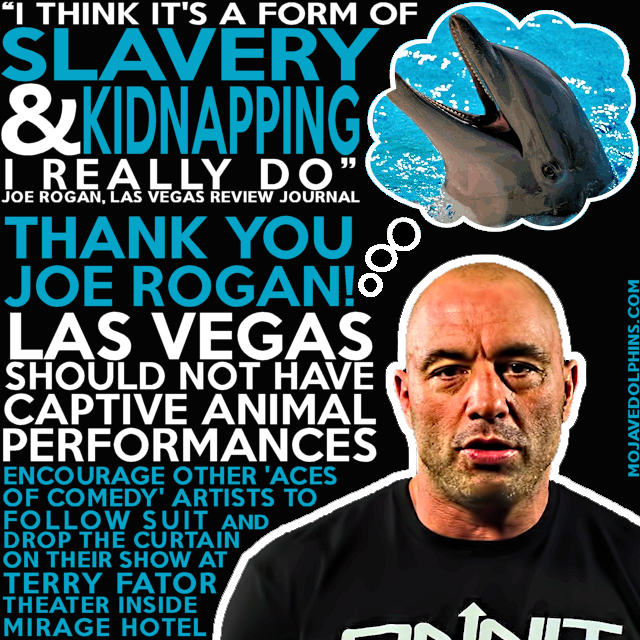 I have recently been informed that you visited the dolphin habitat at the Mirage Hotel in Las Vegas, Nevada. I am writing to inform you that the morals and ethics of keeping dolphins in captivity has become controversial over the last year, and is increasingly being reflected in public opinion in part due to the popularity of the documentary “Blackfish”. In case you aren’t aware, scientific evidence has found dolphins to be “self-aware” meaning that they see themselves as individuals, separate from the environment and other individuals. This trait has only been proven among great apes, elephants, orcas, dolphins, European magpies and of course, humans. The dolphin brain is not only larger than the human brain, but they have a cerebral cortex that is about 40% larger than the human’s. This cortex concerns emotional control, objectivity, reality orientations, humor, logically consistent abstract thought, and higher creativity.Some say that the dolphins are even more emotional than humans. If this is so, how can we ethically confine them to such small living quarters? How would you feel if you lived your life enclosed in a small room? In the wild, dolphins have complex social lives which cannot be recreated in captivity. Dolphins are wide ranging, intelligent and social animals and no holding pool can be adequate to fill their physical or mental needs, no matter how often they are “trained”. There are numerous pictures of the #MojaveDolphins displaying unnatural and dangerous behaviors such as lying listless at the gates and beaching themselves. Beaching in the wild only occurs due to extreme stress. The dolphins have spent more than 4 years suffering from an extreme case of the pox virus, a condition that would normally go into remission in the wild. 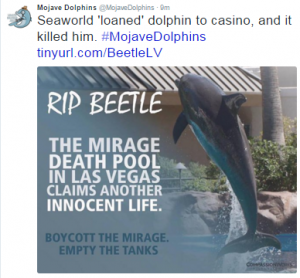 The death rate of the dolphins at the Mirage Hotel and Casino since 1990 is 55%. 12 out of 22 dolphins have died (mostly from stress related illness). Wild dolphins can live into their 50’s, even 60’s. 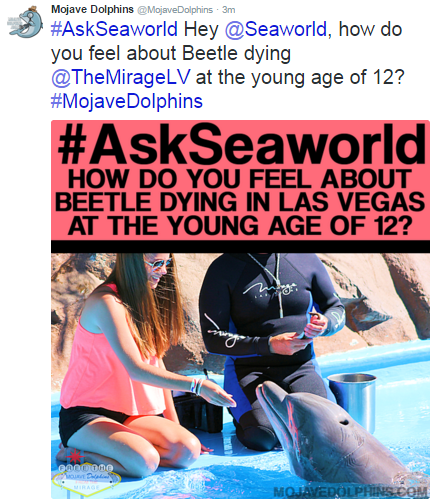 The average age of death at the Mirage habitat is 10.6 years of age. Have you ever been to Las Vegas in the middle of summer? Temperatures regularly sore above 110°F, and we have hit the record of 117°F on more than one occasion. These dolphins do not have any protection from the harsh UV rays. The dolphin trainers have been videotaped applying sunscreen to the dolphins. 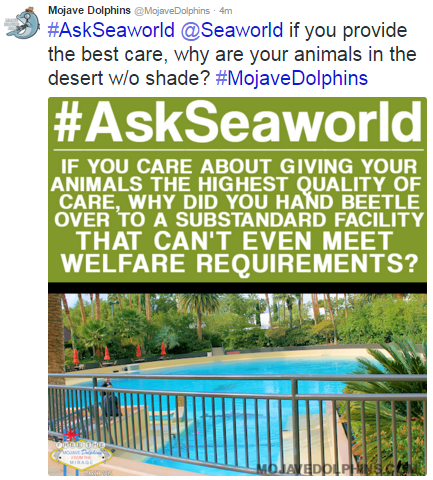 The Animal Welfare Act states that cetaceans kept outdoors should be given a shade structure. 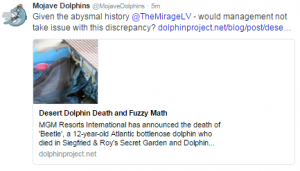 There is a growing grassroots movement in Las Vegas called “Free the Mojave Dolphins” which is focused on bringing attention to the plight of the dolphins trapped at the Mirage hotel. 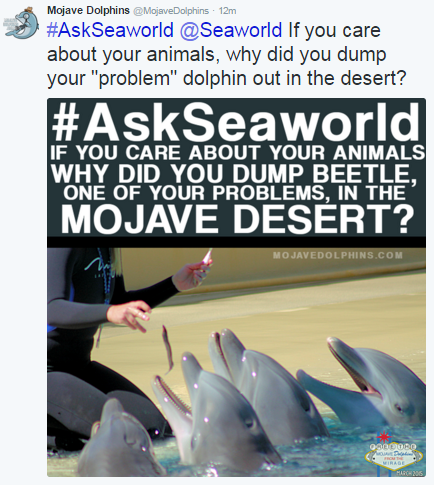 You can find their website at http://www.MojaveDolphins.com. Please consider joining their cause and becoming a voice for the 10 dolphins in Las Vegas. Thank you. 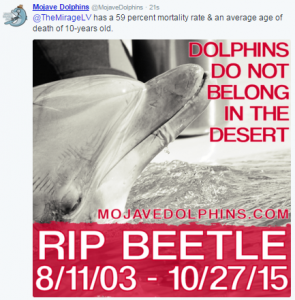 Has the Mojave Dolphins movement finally broken into the mainstream after 25 years? Last night TBS aired an episode of their show Ground Floor titled “The Proposal – Part one (S2E09”). The episode stars Skylar Astin and Briga Heelan as Brody and Jenny respectively. It’s Brody’s birthday, and Jenny is trying to find the perfect gift. She is pointed to his old MySpace page which contains a list of things Brody had wanted to accomplish before he turned 30. 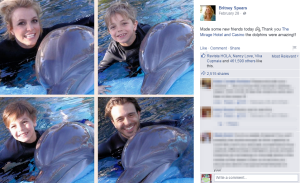 The group will be in Vegas for a wedding, so Jenny decides to take Brody to the Mirage to swim with the dolphins. Brody speaks the truth that we all have been shouting for over two decades. Dolphins do not belong swimming in concrete pools in the middle of the Mojave desert, hundreds of miles from their natural habitat. This brilliant episode shows how far the movement for cetacean rights has come, and specifically the issue here in the Mojave desert. The dolphins have been suffering in this hotel for 25 years, and it has only been recently that the hotel has started to take notice to the shift in the public’s awareness on how they are treating these sentient creatures. 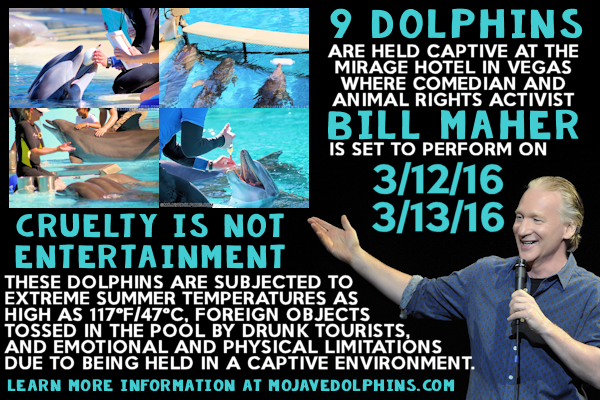 All we need for this to be a successful breakthrough is one person to decide to not attend the Mirage Hotel and Casino due their treatment of dolphins. 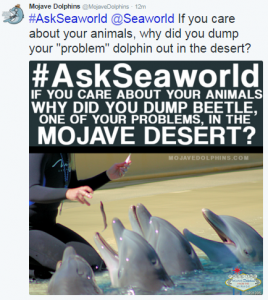 The team here at MojaveDolphins.Com would like to thank the following people for their involvement in this scene and we apologize to anyone we may of missed: Bill Lawrence, Greg Malins, Eric Dean Seaton, David J Booth, Jason Belleville, Skylar Astin and Briga Heelan. We have every reason to believe that someone on the team of Ground Floor has heard about our cause, and we are very thankful for the shout out on national television. We look forward to gaining the support of many more influential people in the future. Please take the time to send a thank you note to the people involved in the making of the episode. Let them know how much it meant to you to see a show finally take a step in the right direction. Also, reminder, if you will be in Las Vegas on 2/28, our next protest is from 4:00 to 6:00 pm! Just click on the tweets & they will open up in a new window, already typed up for you. Just hit send!